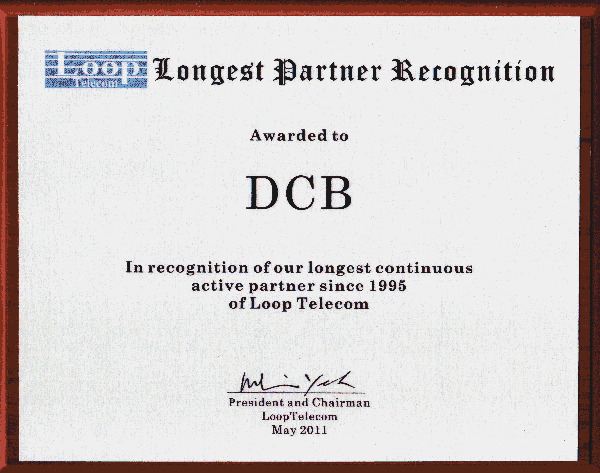 DCB has been providing Loop Telecom products since 1995, selling the products as "Loop" brand. Loop Telecom products were also sold under other private label names, including Bayly. DCB provides North American Warranty Repair for Loop, as well as being a North American contact point for purchasing Loop products. DCB and Loop have partnered for over 15 years, DCB engineers have been trained at the Loop factory, and DCB has sold and serviced Loop products in all segments of the industry in North America. Loop Telecommunication International is a leading manufacturer of SDH/Sonet, TDMoEthernet, DS0, E1, T1, xDSL, G.SHDSL, OC3/STM1, DS3, E3 access and digital communications processing equipment. Since Loop is the OEM manufacturer of many of the Bayly branded products, there is an equivalent in the Loop product lineup for much of your equipment. The box label may read Loop, and in a few products, there may be some small firmware differences, but it's the same high quality equipment you've been using. Most OEM products provided by Loop have direct equivalent expansion or interface cards that are interchangable with the original Loop brand products. Since some OEM'd products sold by Bayly may require firmware upgrades to use newer CPU cards and such, please phone us for details if you need to update, expand, or replace existing OEM equipment. This table lists some of the more common product equivalents. Loop Telecommunication International is a leading manufacturer of SDH/Sonet, TDMoEthernet, DS0, E1, T1, xDSL, G.SHDSL, OC3/STM1, DS3, E3 access and digital communications processing equipment. DCB is your source for all Loop products,including SDH/Sonet, TDMoEthernet, DS0, E1, T1, xDSL, G.SHDSL, 0Cx/STMx, DS3, E3, T1/E1 Access Multiplexers.. DCB and Loop have partnered for over 15 years, and DCB engineers have been trained at the Loop factory. Our in-house design and manufacturing, strong position in the telecommunications marketplace, and long-term partnerships with other quality manufacturers have served our customers well... and we're looking to partner with our existing and new customers and suppliers for many more years. In addition to Bayly branded equipment, other current production and obsolete multiplexer brands such as Penril, Baytech, Comm Design, Coastcom, Micom, Multitech, Data Race, Timeplex, Codex, Racal, and others are also easily replaced with DCB products. Data Comm for Business is in the data communications business for the long term. We are constantly improving and enhancing multiplexer technology, so when you are ready to upgrade or replace those older multiplexers, consider a modern replacement from DCB. All DCB web pages copyright �1995- Data Comm for Business, All rights reserved. EtherPath�, EtherSeries�, EtherPoll�, EtherBridge� and EtherModem� are Registered Trademarks of Data Comm for Business, Inc.